Protecting and enhancing the independent contractor capacity model that is so vital to the trucking industry and the economy of the United States. In the U.S. trucking industry there are over 3.5 million professional truck drivers needed day in and day out to move our nation’s freight. Truck driver capacity is met in many ways: employee drivers, union drivers, independent truckers, large trucking companies, mid-sized trucking companies, and small trucking companies. This coalition recognizes and respects that all of these models are fundamentally important to the ability to viably, safely, and competitively move our nation’s freight. Without any one of these models, the U.S. economy and the average consumer suffers as demand simply outweighs supply when it comes to moving freight. Truck drivers, like most professionals, have choices when it comes to how to make their living. Many choose to be employees of a trucking company. Their decisions are based on the size of the operation, the freight hauled, the lanes they run, the wages they earn, the benefits they receive, and of course the equipment provided. At some point in a driver’s professional life cycle, they reach a point where the question of “Where do I go from here?” presents itself. Do I stay in the industry? If I stay, what is the path forward that best suits my needs, wants, and ambitions? Apply for a federal motor carrier number, buy equipment, secure customers, and start a new company from the ground up. Buy equipment and contractually align yourself as an independent trucker with an established trucking company. Again, every mode of freight capacity is fundamentally important to the U.S. economy and the end consumer. That said, this coalition recognizes that the professional independent trucker, who chooses to drive a truck professionally and ultimately elected to seek out entrepreneurship, needs support. The professional independent trucker model accounts for a significant portion of our nation’s professional truck capacity and has a history in the trucking industry that is as long as trucking itself. In many instances, it serves as the bridge between being an employee driver to becoming a full-fledged motor carrier with a federal motor carrier number. In other instances, this model is the ultimate professional destination for the truck driver. They are a small business, often operating one truck, where they choose the carrier they contract to. They get to pick and choose freight, buy the truck that best suits their professional goals, pick and choose vendors; yet they don’t have the pressures of maintaining the customer base, the federal motor carrier number, and the payroll of employees. The professional independent trucker model is one that works well as a stepping-stone for some, or a perfect, long-term fit for others. This small group of professional independent truckers needs to be heard and advocated for. There are academics, lawmakers, attorneys and others that think they know what the professional independent trucker is working for each and every day. New whitepapers are written, laws are proposed, lawsuits are filed – but where is the professional independent trucker’s voice? The Coalition for Independent Truckers is intended to be a coalition of motor carriers, independent truckers, service providers, independent associations and affiliated organizations committed to the very singular mission of protecting and enhancing the independent contractor capacity model that is so vital to the trucking industry and the economy of the United States. The non-partisan coalition represents a unified and powerful voice that believes the hundreds of thousands of truckers operating as independent contractors, each one a vibrant and relevant small business, constitute an irreplaceable element of our national logistics network and the U.S. economy. We believe all models of professional truck drivers can and should exist in the U.S.
We believe professional independent truckers deserve access to academics, policymakers, and the general public so they can share their stories, their personal and professional goals, and ultimately assure this model remains viable. These people are small businesses and our nation has always been built on the backs of small business. Professional independent truckers also need resources and support to stay relevant and viable in an ever-changing economy and freight environment. Supporting an operating environment that promotes the continued generation of independent contractor capacity, thereby creating more small businesses and jobs for the U.S. economy. The coalition will be funded through a combination of dues and voluntary contributions. The coalition will meet in person and/or via conference call one or more times per year. A minimum two-year commitment will be expected of supporting companies and organizations. 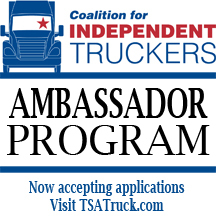 As part of this mission, the coalition launched the Independent Contractor Ambassador program to create outreach opportunities for independent contractors to educate policymakers, the media, and the general public on the important role the independent contractor business model plays in the trucking industry. APPLY: Interested independent contractors are encouraged to apply to be Independent Contractor Ambassadors by submitting the official application form. The professional independent trucker model accounts for a significant portion of our nation’s professional truck capacity and has a history in the trucking industry that is as long as trucking itself. In many instances, it serves as the bridge between being an employee driver to becoming a full-fledged motor carrier with a federal motor carrier number. In other instances, this model is the ultimate professional destination for the truck driver. Independent Contractor Ambassadors will serve the industry by advocating in state capitals, attending conferences, penning op-eds, and speaking to the media. The ambassadors will personally and systematically deliver the message that the independent contractor business model is critical to the trucking industry and allows capacity to be optimized. Independent Contractor Ambassadors will receive a stipend of $600 – $650 per day during an event. They will also be reimbursed for expenses incurred during the ambassador event, including items like parking and meals.